What will you and your groom wear once the wedding festivities have all come to a close? While any bride could stay in her wedding dress all night (or longer), we’re guessing your new husband is antsy to get out of his tux and into something more comfortable. Here at Bridal Party Tees, we have the perfect solution for the new Mr. and Mrs. to relax in: matching bride and groom shirts! There is no better time for a couple to celebrate being an item than around the wedding, so matching couple shirts are more than appropriate for this occasion! However, not all matching couple shirts are created equal. 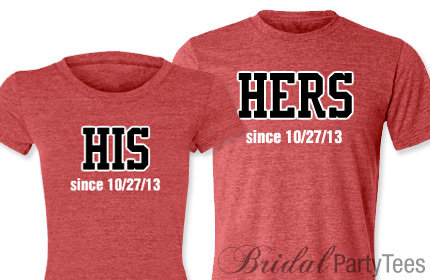 You’ll need matching couple shirts that can easily be customized with the date of your wedding and new last name. Not to mention, since these are couple shirts, you will need to find a matching shirt that your husband will also want to wear. 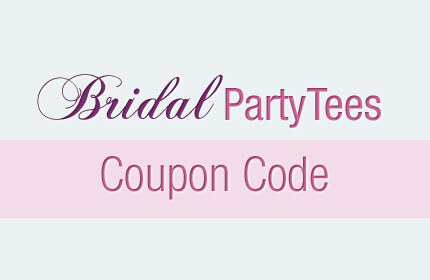 Neither of these are problems when you shop at Bridal Party Tees. We have many designs and shirt styles that both you and your husband are sure to love! Find the bride and groom couple shirts that will make your final send off as new husband and wife memorable! See more matching couple shirts on our sister website Customized Girl! It’s finally here! Your last night out before taking the plunge and tying the knot! When your bachelorette party finally does arrive, it will signal how close the wedding really is. But where would a bride be without the help of her bridesmaids? Would the bachelorette party even happen? After all, a lot of work goes into planning every aspect of the wedding and it’s almost impossible for the bride to do it all alone. That’s why every wife-to-be has team bride by her side! When all your wedding details start to wind down, your bachelorette party will be the perfect time to cut loose and enjoy your last night out with your team of wonderful bridesmaids! With team bride being on your side from the start, it would only be appropriate to carry this mantra over to the bachelorette party! You can do just that with Team Bride shirts. Using the team bride concept for weddings and bachelorette parties has been a popular one amongst many brides. 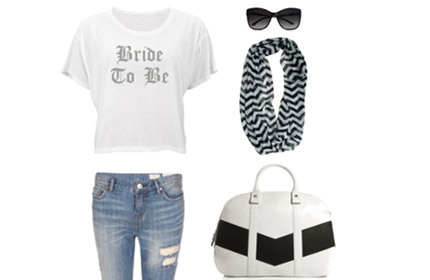 That’s why we are always adding new twists on our Team Bride shirts like our “Last Night Out” design. We love seeing our customers in our designs so we have to share these photos from one of our happy customers! This customer used the Team Bride “Last Night Out” look to create a memorable bachelorette party for all the girls involved. 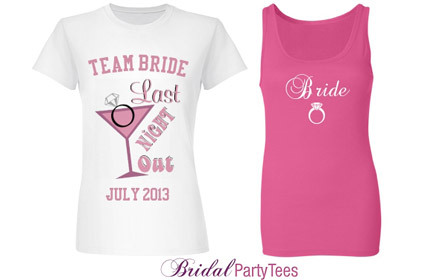 While the bridesmaids wore the Team Bride “Last Night Out” shirts, the bride rocked a pink bride tank top to stand out at her bachelorette party! One way that every bride can put a signature stamp on her wedding, (and at the same time not spend a fortune), is to tackle some do-it-yourself projects. 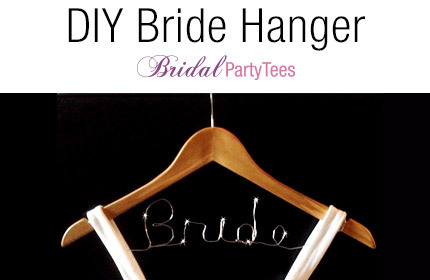 One DIY project that caught our eye was the wedding name hanger! This DIY project should cost you no more than $10 and depending on your craft level, this project is pretty easy to complete! Step One: Clear a spot for this project and unwrap everything you have purchased. Step Two: Role out some of the wire and wrap the starting end around one of the hanger notches. Loop the wire around the notch about three times, so it is secure and so the sharp end of the wire is not exposed. If it is easier for you, feel free to unroll about 6ft of wire, so you don’t have to work with the spool of wire hanging off the end (that’s what we did and it really helped). Step Three: Once you have the wire wrapped around one of the hanger notches, make sure you have enough wire to spell out the name or word you want. Make sure to also leave enough extra wire space before you start bending your first letter in order to keep the word centered as much as possible. Step Four: After you have allowed the extra wire for spacing, begin bending the wire to spell out the name or word you want. If this is your first time manipulating wire, don’t get too discouraged, it might take you a few times to get the hang of the process. It took us three tries before we finally got the hang it! Step Five: Once you have completed spelling out the name, save a little extra wire at the end of the name for centering and then begin wrapping the wire around the final hanger notch. Step Six: Once the wire has been wrapped around the final hanger notch, cut the wire from the spool (if you left it connected in an earlier step). 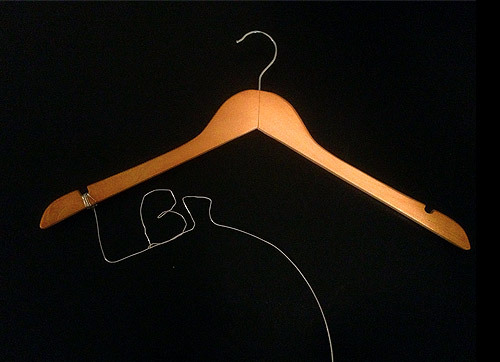 Step Seven: Enjoy the custom hanger you just made for yourself or for one of your bridesmaids! Tip: The project went so much better for us once we detached the wire from the spool. Once the wire was off the spool, it allowed us the flexibility to wrap the wire more easily and in different directions for some of the trickier letters like ‘b’ and ‘d’. 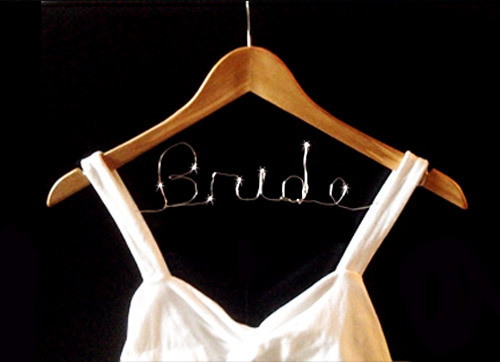 This is just one of many ways you can create a wedding name hanger. We have seen some brides place the names over the sides of the hanger instead of having it completely centered and inside the hanger. You can also spruce up the hanger by painting it to match your wedding colors or by adding some ribbon to the top of the hanger. 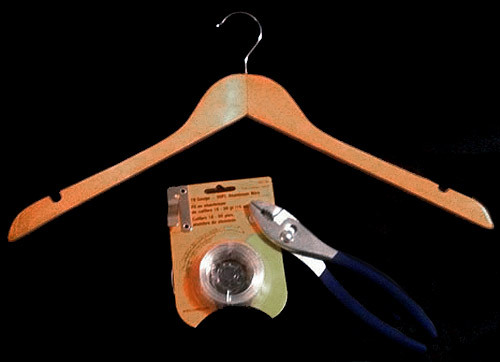 And, even if you decide that bending wire is not your thing, try painting the hangers instead! 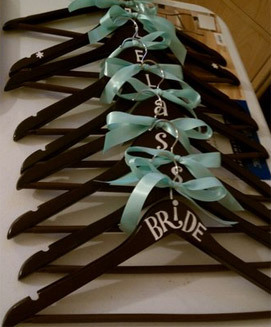 Simply paint your bridesmaids’ names on each hanger and let it dry! It will be equally beautiful, a treasure she will cherish and maybe even something she will try for her or another friends’ wedding! Use coupon code BPTW6 at checkout and get 10% off your order. 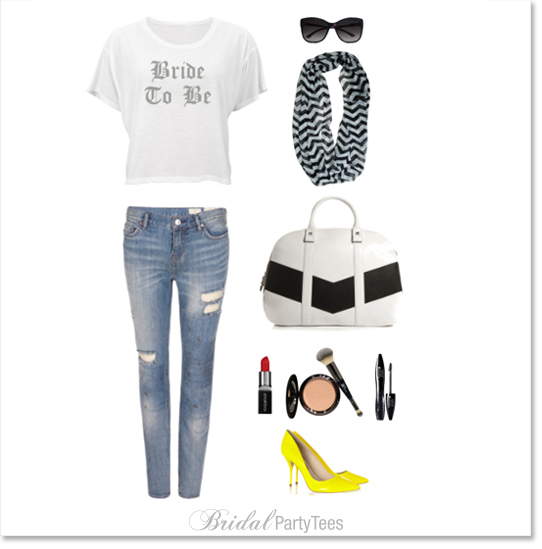 Create the bachelorette party tees and bride shirts you need for the summer wedding! Offer expires 06/30/2013 at 11:59 PM EST. With the wedding date moving closer and closer, it can be easy to hold off on getting dad a Father’s day gift until the last minute. After all, it’s not easy making your dream wedding a reality! However, what if you could find a way to get dad a Father’s Day gift while also incorporating the wedding? Well there is! Give dad a father-of-the-bride shirt he’ll be proud to wear over and over again! As much as you are looking forward to the day of your wedding, so is your dad. He might not always seem that way when he is picking up some of the bills for the wedding, but he is no doubt happy that his little girl found someone special. For everything that dad has done to help out with the wedding, he deserves something special and unique this Father’s Day. 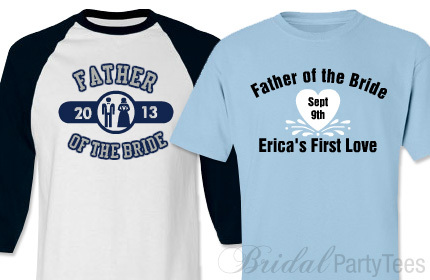 Make dad’s day extra meaningful this year by customizing a father-of-the-bride shirt, made by the bride herself! If your dad loves a good laugh, we have some really hilarious father-of-the-bride shirts that will make him crack a smile. We also have more subtle designs for the sentimental dads out there. As great as these father-of-the-bride designs are, remember to complete the look by adding in your own unique touch! Customize it to match dad’s personality and maybe even to coordinate with the wedding theme and colors! Once you have your father-of-the-bride shirt chosen, ask your fiancé what he will be getting his dad for Father’s Day. If he still needs a gift, mention that we have father-of-the-groom shirts too!